Any layman would have the latest facts and figures about real estate and where all the realty action is centred in the NCR, if one were to go purely by the number of SMSs he or she receives about real estate every day. Be it Dwarka Expressway, Noida Extension , Noida Expressway, Raj Nagar Extension, action in real estate is all concentrated in certain pockets of the Delhi NCR region. So where is the realty action concentrated at the moment? “The expressways and national highways is where all the property development is taking place,” says Sushant Muttreja of Earth Infrastructure. The company recently launched two residential projects , one on the Dwarka Expressway and the other on the Yamuna Expressway . “People look for affordable housing and these can only be provided at these high-speed transport corridors that offer good connectivity and affordable options,” Muttreja says. People from different parts of India are continuously migrating into the Delhi NCR to study, explore new businesses , land a job, or for career advancement . Thus, the population here is increasing exponentially and there is a huge requirement for residential and commercial space, as well as social infrastructure, to cater to these burgeoning numbers. 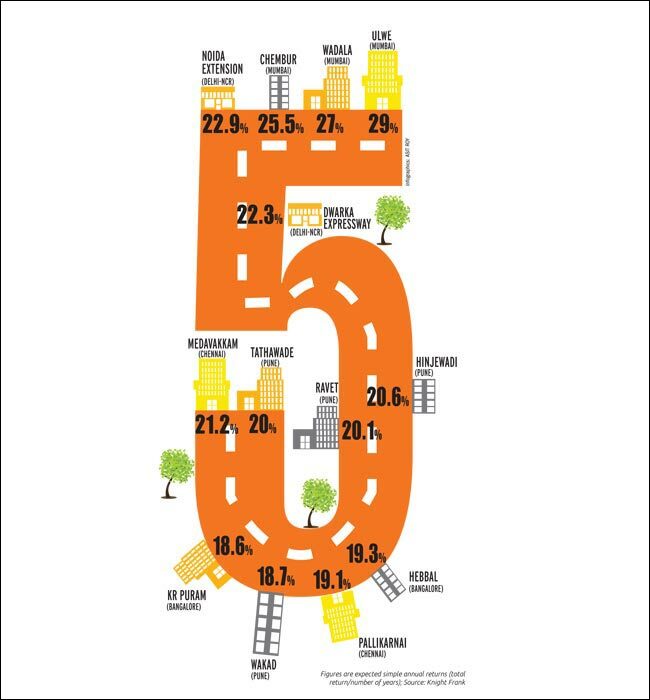 No wonder then that the expressways and national highways are turning into hubs for realty action. These offer excellent connectivity by road and existing and proposed connectivity by the Metro network and the infrastructure being developed by the respective state governments and civic authorities here has given a boost to their realty profile. Projects are mushrooming along the Noida-Greater Noida Expressway, the Yamuna Expressway, the KPMG expressway, NH-24 , NH-58 , NH-8 , NH-1 , the Dwarka Expressway, Raj Nagar Extension at a rapid clip and finding favour with end users and investors alike. 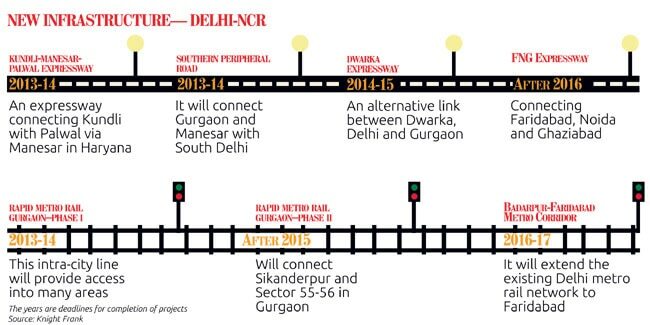 Take a look at the Dwarka-Gurgaon Expressway, which is an 18km stretch of 150-metre-wide road, starting from Dwarka Phase 2 and joining NH-8 near Kherki-Dhaula . The average rate is approximately Rs 3,600 per sq feet and sizes here range from 1,200 to 3,000 sq ft. The main developers here include BPTP, Ramprastha, Indiabulls, Uppals, Raheja, Sobha, Chintels, Spire, etc. Apart from the connectivity through the expressway, this area is also close to the IGI Airport and is preferred by pilots and senior staff of most airlines. NH-8 , yet another significant hub of realty action, has the presence of several builders like Raheja, Emaar MGF, Vatika, Godrej, Anantraj, etc. The price range here is Rs 4,200-4 ,500 per sq feet. This area commands a premium as the connectivity is already good and there is excellent social and physical infrastructure on the Dwarka Manesar E-way . Raj Nagar Extension is another case in point. It is a unique case of not just geographical clustering of projects but one where instead of individually selling projects, a conglomeration of developers have jointly promoted the place over product. 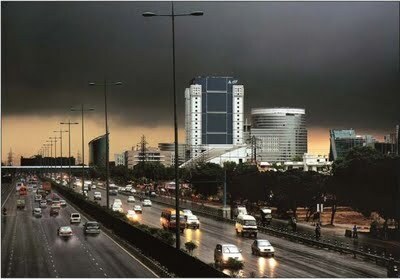 Raj Nagar Extension, located on the National Highway 58 in Ghaziabad, is a unique experiment where 24 developers have come together to market projects in an area that is along a major transport corridor. The branding of Raj Nagar Extension is clear in the mind of the end user as ‘quality housing at affordable rates’ . There is uniformity in what is on offer: these projects are primarily targeted at the middle class with the 1- to 3BHK being priced between Rs 12 lakh and Rs 40 lakh. Marketing the area jointly has helped in cutting down on marketing cost of individual developers; also, developers coordinate with the authorities for expediting the development in that area.